The royal lineage of Tudor dynasty started with Henry VII in 1485 and ended with Elizabeth I in 1603. Lasting for 118 years. This dynasty was one of the most influential and greatest in Britain. But like all other historical stories surrounding the royal throne, not everything is all tea and biscuits. Speaking of tea and biscuits, you would be amazed by what the commoners, as well as royalties, drank during those times. Living in England during the period of Tudor was not easy. With a high infant mortality rate of about 14%, reaching adulthood was already a high achievement, and with a life expectancy of only 35 years, reaching the age of 40 makes one considered as an old man or woman. Life in England was also chaotic and violent. Due to poverty, crime rates were high. Some of the crimes they considered before were too ridiculous and preposterous. Being homeless and gossiping was considered an unlawful act. Although there were no police forces in the Tudor period, crimes were not left unpunished, and punishment was very severe. The overall living condition was very harsh. Physical hygiene in the past was not the same as with our standards today. This mostly involved just wearing clean clothes and less of physically cleaning oneself especially when illnesses linked to sweating and open pores were on high alert. With their growing population, waste disposal was a problem. Manure of humans and animals alike were sitting in open sewers on their streets. During the period of Tudor, water both provided life to humans and takes them away. Getting a fresh and clean supply of water was hard. Water sourced from wells, streams, or village pumps were so polluted that you could get an illness from drinking it. Due to this, the residents of England often chose to drink alcohol instead of water. When you think about this now, it is a bit funny to think that alcohol is healthier than water, but unfortunately, it was the truth for that period. Drinking alcohol was so common that it became the new water in England. Milk was not an option since it was mostly used to make cheese and butter. Whether it’s the early morning and during breakfast, lunch, or dinner, alcoholic beverages were the only way to quench their thirst. Drinking alcoholic beverages was more common than drinking water during the Tudor dynasty. Everyone was drinking alcohol, whether you were a royalty or a commoner. Even the Queen Consort of Henry VII, Elizabeth of York, advised Isabelle of Castile to let her daughter, Catherine of Aragon, get used to drinking wine before going to England. Drinking also had its social segregation. Depending on their class and financial status, alcoholic beverages enjoyed by residents in England during the Tudor dynasty were an ale, beer, strong beer, wine, cider, or perry. Ale was the traditional drink of the 15th century and half of the 16th century in England and Scotland. This commoner’s drink was produced from malted barley as well as water. The problem with ale is that it spoils easily. After fermenting ale, it is recommended to drink it as soon as possible to avoid it from spoiling. After the end of the 16th century, ale was becoming to be replaced by a new alcoholic drink imported to the continent. Beer, much to the dismay of older people, replaced the traditional drink of Tudor period. Similar to ale, beer is produced from malted barley. However, hops were added to the beer. The addition of this extremely bitter and strong substance paved the way for alcohol preservation. Instead of lasting for just a few days, the people during the Tudor period could now enjoy and keep beer for a few weeks. Strong beers also become popular in the Tudor period. Also known as dagger ale, mad dog, or dragon’s milk, when consumed, this beverage gives the user a quicker onset of alcohol effect. Much like the culture today, the wine was generally consumed by those with who could afford it. The wines available in England at that time was of low quality, so members of the higher social classes that could afford wine imported them from countries such as Germany and France, where the temperature was right enough for grapes to grow. There were also instances where wine was imported from Spain and Portugal. The Eastern Mediterranean also brought sweet wine to England. These wines were often consumed warm or flavored with spices to disguise the spoilt taste. Cider, which was produced from fermented apples, and perry, from fermented pear juice, were a popular beverage in the West Country and normally consumed by the poorer residents of England. If you think the high rates of alcohol use and abuse as well as the common scenery of drunkards on the streets of England is a modern event, then you are wrong. The prevalence of alcohol abuse in England dates back as early as the Tudor dynasty. The problems with alcohol abuse were so bad that even Elizabeth I had to intervene and forbid the distribution and consumption of double-double beer, a very strong alcohol. This intervention, however, did not hinder her subjects. Despite social controls on alcohol consumption, her courtiers still consumed about 600,000 gallons of ale in 1593. 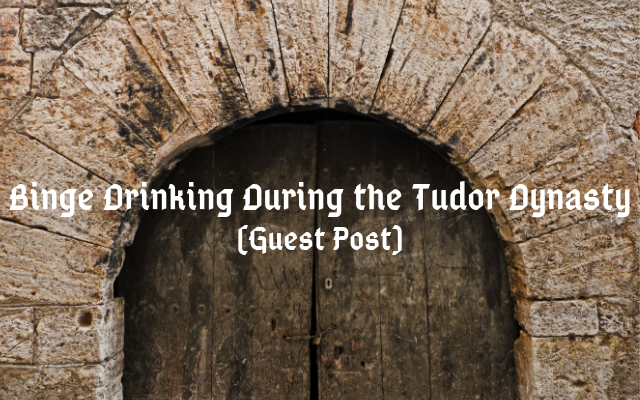 Drinking alcohol was a normal event during the Tudor dynasty. People would consume about an average of 17 pints per week. But as normal as it was, drinking was considered a crime during that period. Officials were always on alert for drunkards and kept an eye out for any signs of alcohol overindulgent. Those who were found to be walking around town drunk were forced to go through embarrassing punishment. There were even instances when people who wet their bed and thought to be guilty of alcohol abuse were punished. It was not only the poor that were punished. Even royalties and higher ranked social classes were given punishments. Drunkards were required to wear a hollowed-out beer barrel or sit and spend time in the stocks as punishments.